As a writer as well as a creature of the human variety, I know that endings matter just as much as beginnings. It’s easier to focus on the starting things (the blank page, the new sprout, the fresh-faced baby) rather than the end things (wrinkles and piles of baggage and creaky joints), but how we exit matters just as much as how we enter. During the next month and some change, we have the opportunity to end 2013 in style and with grace, instead of with the screw-it-I’ll-just-do-whatever-seems-easy-because-I-can-start-fresh-in-the-new-year approach, which usually involves varying degrees of Alka-Seltzer and disappointment. Here’s a question I’ve been chewing on: What if the end of this year, the oldest time of it, is my opportunity to make good on the promises I’ve made to myself, to embrace the deep and nourishing pleasures I’ve been putting off? When I ask that question, I get excited, like I do at that moment in movies when I think everything’s going to be ruined forever, but something hopeful jumps out or glimmers in the distance or wafts through the air, and I know it’s not time to give up. 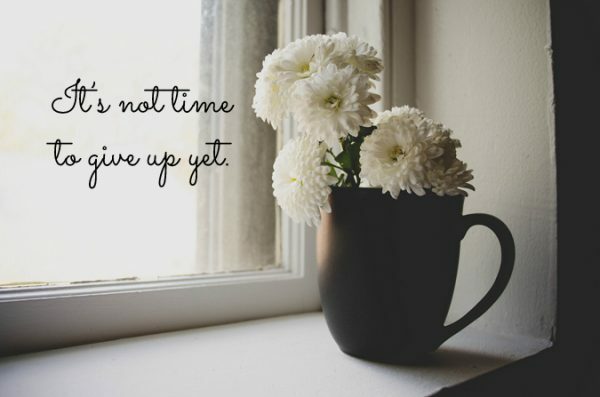 I guess mostly that’s what I want to say to you right now: it’s not time to give up. So here’s this month’s hope-laced FHP activity: Sometime this week, take a quiet half hour and make some Old Year Resolutions. Ponder ways and set intentions to make a grand and lovely exit that will be lauded by children and elders, told and retold at tables that haven’t even been built yet. Light a candle, don your best elastic-wear, pour a cup of coffee, and do it. The best is yet to come. Wear as few bras as possible. I’ve been thinking a lot about structures, the ones that work for me and the ones that hold me back from joy, literally and figuratively. As I get clear about the structures, I’m making changes, big and small. This applies to work, but it also applies to lingerie, and here’s the truth: bras irritate the crap out of me. Sometimes I like how a bra makes an outfit look or how it can keep the girls from bouncing around. But mostly, at the end of the day, all I want to do is take it off, which makes me wonder why I put one on in the first place. Rest when I need to rest. This means lying on the ground with my eyes closed, at least twice a day, to give my back and eyes and whole self a rest from sitting at the computer. Play when I need to play. This means actively lightening up when I start to feel burdened or morose. This means dancing around the living room, putting on the show tunes or the Nine Inch Nails, depending, and rocking out. Take as much time for solitude as I do for socializing. When I have solitude, be present and not check out. When I finally get the quiet time I crave and come face to face with all that I haven’t been facing (EEEK! ), it’s easy to fill those moments with movie marathons and French onion dip. Not that either of those things are bad, but for me they can sometimes veer beyond entertainment and into escape from what I really need, which might be, for instance, time for writing or meditating or clearing clutter. Drink lots of water. I feel better when I do. 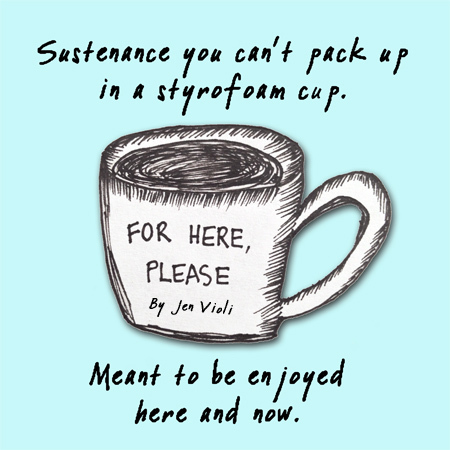 Savor rather than stuff. I think many of us have been raised believing the big lie that holiday gorging on food or alcohol is worth it, that we deserve it, that the quantity we consume and the speed at which we consume it somehow show we’re celebrating or abundant or successful. Within that lie, I know I can forget essential things like chewing and breathing. I can also miss the soul-level hunger that won’t be satiated by extra stuffing (no matter how delicious that stuffing is, what with the mushrooms and the sausage and the butter). What I’ve come to believe is that deceleration and quality, mindful living indicate success, abundance and celebration. I like to think of the birthday dinner scene in the movie Chocolát, when all of the attendees eat the deliciousness in slow motion. For the rest of 2013, that’s how I want to eat. And live. If you feel comfortable doing so, I invite you to share your lists here. I know I’m always inspired by the beautiful intentions of others. So go on, let your commitments be contagious. Regardless, may the end of your 2013 be, as all good stories are, both thoroughly satisfying and leaving you wanting more. Photo Credit: Mums In A Mug by Kelly Sikkema is licensed under a Creative Commons Attribution 4.0 International License. Fabulous reflections for the year end. Of course I would expect nothing less form you dear girl! Thank you so much, Jo, for reading and complimenting. A happy and beautiful year’s end to you!